Ho ho ho! ‘Tis the season to be jolly and give. Not only this, but ’tis also the season to build some dope Christmas themed hardware! Here at Mailjet, we decided to put together a Christmas tree that has lights and an LED dot matrix (acting as the star on top) that is controlled via email through our inbound email processing API – Parse API. Want the lights to be blue? Email christmas.tree@mailjet.com with the commands and it will change! Want a beautiful gold star displayed on the dot matrix at top? Email that in the subject line and it will update! In this post, I’m going to give a step by step guide for amateurs in the hardware game on how to wire the components, upload the software, and have a fully functioning email controlled Christmas tree of your own. Want to see one in action before making one of your own? I purchased all of my components from Adafruit. They are super reliable and provide libraries for most of their hardware and breakout boards. I purchased the Christmas tree on Amazon. I choose a 2ft tall one, seeing as it would be in an office. For this height, I figured 2 meters should suffice. Also, I found that 30 LEDs per meter was a good amount for this height. If you wish to have more lights on your tree, I would get the 60 LEDs per meter strip . Keep in mind, this will increase the total cost of your project. The microcontroller I used is the Spark Core. The reason I picked the Spark Core is that it is Arduino-like and has a built-in WiFi module. To access the Spark Core via WiFi, all you have to do is declare a function, the endpoint to call it at, and Spark Core will execute this function when a POST request is done to the endpoint. It’s super easy, very efficient and so, it was the logical choice for this particular project. Once you get your Spark Core, head on over to their getting started page. This will give you a brief overview on how to use it. Essentially, you will need to make an account and connect the Spark Core to your local WiFi. Having the Spark Core connected to WiFi is essential for this project, so make sure this is working before beginning. After acquainting yourself with the microcontroller, go to their Web IDE. There, you will find two essential codes you will need to communicate with the Spark Core – your “Device ID” and your “Access Token”. Without these, you will not be able to change the lights on the tree. I have consolidated all of the software you need in this Github repository so you can get your tree up and running as quickly as possible. Simply clone the repo, initiate Mailjet’s Parse API, get the server up and running, and upload the software to the Spark Core. You may be asking yourself how this whole thing will play out in real-time. We will essentially have four pieces of technology interacting with each other, much like a game of telephone. One piece gets information from the previous, manipulates it a bit to make it easier for the next piece of technology to understand, and then dumps this data onto the next piece, all the way until we have LEDs changing colors! First, a person will send an email to the email address you have associated with Mailjet’s Parse API. Mailjet’s Parse API will then receive this email, dissect it down into it’s individuals components (to, from, subject, body, etc. ), and then dump the contents of that email onto the web server via a POST request. The web server then takes the pertinent information – the commands – from the the body of the email, performs a bit more logic and formatting before it sends them over to the Spark Core via another POST request. The Spark Core receives the information and executes the functions defined in it’s firmware for changing the LEDs, the dot matrix background, and icons depending on the commands it has received. First, I will explain how to wire the LED strip and the LED dot matrix. Then, I will explain the Spark Core software that controls each of these. Then, I will explain how to setup your Mailjet Parse API instance. Last, I will explain how to setup the web server that will accept the emails from the Parse API that then communicates with the Spark Core. First thing’s first, place the Spark Core in the middle of the your breadboard. To keep with consistency, make sure the “+” lines are always to the left of the “-“. There will be four wires coming out of the LED strip: one red, one white, and two black. The black and red wires on the left-hand side are the ground and power, respectively, lines for powering the strip. The black and white wires on the right-hand side are the ground and logic wires, respectively, for the updating the colors of the LEDs on the strip. Basically, the ones on the left make it light up and the ones on the right change the colors. Insert the exposed wires for the power into the female end of a male-female wire. Next, insert a jumper wire into each of the logic wires. Flip the dot matrix over to have a look at it. There will be a few in and out pins, but we only need two for this tutorial – logic and power. The other is for hooking up tandem dot matrices. Each one of these holes corresponds to some portion of the logic that will make the dot matrix display and light up in different patterns -the amount of red/green/blue in a pixel, the timing, etc. I suggest wrapping this piece in electrical tape to avoid any unintentional pulling and loosening of wires. Now, connect the other end of the grey cable into the the back of the dot matrix in the port that says “IN”. The LEDs and the LED dot matrix require their own power supply. Because of this, we will use a 5 volt 10 amp power supply. In order for this to play nicely with our Spark Core and other components on the breadboard, we’ll use a female DC Power adapter. Plug the adapter into the output of the power supply, insert one wire into the positive terminal and another into the negative terminal. 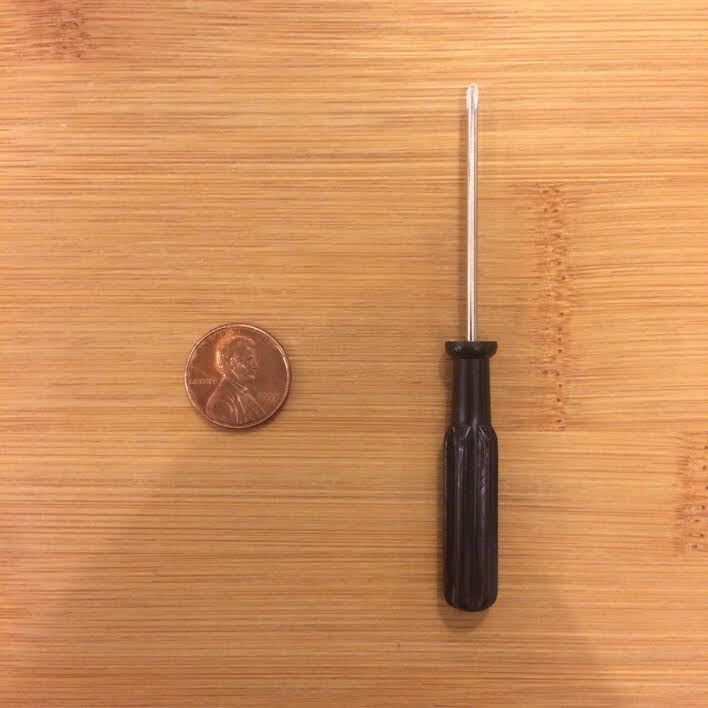 Tighten the screws on top with the “mini”ish screwdriver to keep them in place. I also recommend wrapping this junction in electrical tape if possible, to avoid unintentional wire pulls. Plug the positive wire (red) into the “+” on the breadboard, and the ground wire (black) into the “-” on the breadboard. In order to protect the LED strip, we will connect a capacitor across the “+” and “-” on the breadboard. When doing this, have the long wire coming out of the capacitor in the “-” and the short wire into the “+”. The wiring should be all ready to go. You can plug it in at this time, but don’t expect anything to happen just yet because we haven’t uploaded any firmware to the Spark Core. I would recommend prototyping and testing on a solderless breadboard first. Once you know the wiring is correct, I would move it over to a more permanent PCB (printed circuit board). The reason I say this is because these are lights on a Christmas tree, and such decorations always present a fire hazard. To take extra precaution, solder it and apply electrical tape to all exposed wires before placing everything on your tree. If for whatever reason an error pops up saying there is a library that isn’t included, you can go in and add them manually by clicking the libraries icon, searching for the SparkIntervalTimer library and the Adafruit_mfGFX library and click “INCLUDE IN APP”. I have written the firmware to turn the lights and matrix on when the Spark Core starts up. If you see this happen, the Spark Core firmware has been uploaded correctly. To start off, we will host the web server on your local computer for testing purposes. Once all of kinks are worked out, we will push it up to Heroku where your app will live in the ether of the internet! At the moment, only you can access this web server from your computer. This won’t work for us, seeing as we need Mailjet’s Parse API to access your computer. To solve this, we’re going to open up your computer through local tunneling via a service called ngrok (if you don’t already have this set up, go to their site, download, and acquaint yourself with the service). For this particular case, the server is at http://3cbc1861.ngrok.com. Write yours down as you will need it when setting up Mailjet’s Parse API. For the rest of this tutorial, I will use http://3cbc1861.ngrok.com as the server URL but remember to use what ngrok gives you, otherwise Mailjet will deliver the emails to the wrong URL! Specifically, we have the web server accepting POST requests from the http://3cbc1861.ngrok.com/email_processor endpoint. If at any point you wish change the logic in the web server before the information is delivered to the Spark Core, you will find that in app/controllers/change_lights_controllers.rb. If you have already gone through this tutorial and everything is working nicely, you’re going to want to host the web server in the cloud rather than on your computer. To do this, we can push our Rails server up to a service called Heroku – a web hosting service. If you don’t already have a Heroku account, I would sign up and acquaint yourself with the service. It’s pretty awesome and free. Once this is up and running, remember to update the URL in your instance of Mailjet’s Parse API to whatever the URL is of your Heroku app. First thing’s first, we need to find your API Key and Secret Key for your Mailjet account (if you haven’t already done so, sign up for Mailjet here). You will find them here under “configure my SMTP” on the main dashboard. Keep these secret, otherwise someone can send emails on your behalf! curl -s -X —user "API_KEY:SECRET_KEY"
Now that you have all of the the hardware wired, all the firmware uploaded, and the server up and running, it’s time to decorate the tree! From my experience, the best way to do this is to put the dot matrix at the top of the tree first and then wrap the LEDs around the tree going from top to bottom. To mount the dot matrix at the top of the tree, I screwed in the four magnets to the back (these came with the dot matrix) , then placed the rubber band onto one of the sides, twisted the rubber band a half turn, then put the other side of the rubber band on the other side of the dot matrix – essentially creating an “X” with the rubber band that effectively mounts it to the tree. Here is what it will look like once you’re done! At the moment in the Github repo code, you can email up to three commands by putting them in the body of the email. The three commands are “lights”, “background”, and “icon”. Below is a list of all currently available options for each of the commands. “lights” changes the color and pattern of the lights around the tree. “background” changes the background color of the display on top of tree. “icon” changes the icon on the display on top of the tree. And that’s it! Enjoy your email controlled Christmas tree! If you see any bugs or wish to add more light patterns, dot matrix icons colors and icons, send me a pull request or email me at tyler@mailjet.com. Big Brothers Big Sisters of NYC serves over 3500 children finding them mentors to help ensure their success in life. We do this by partnering with families, volunteers, companies and the community to inspire a positive change in all. Visit www.bigsnyc.org to learn more about becoming a BIG or to donate towards our Education Initiative.